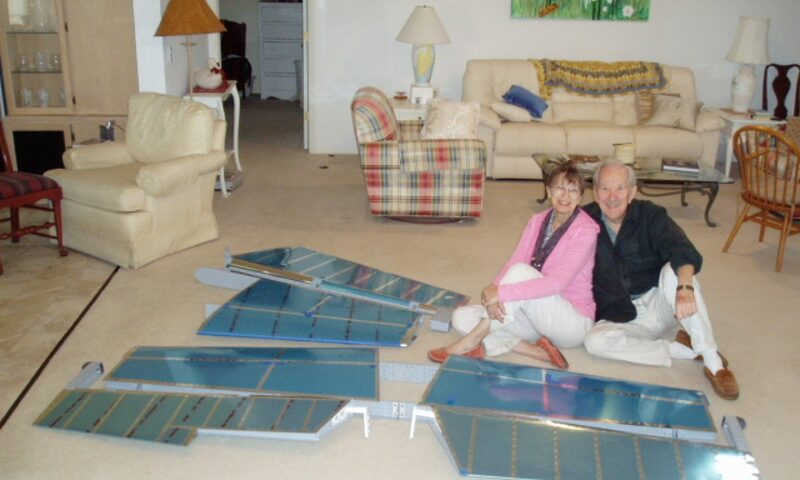 Dolly and I built the horizontal and vertical stabilizers & the rudder and elevators (the empennage) during the winter of ’14/’15 in Florida. The parts were wrapped in blankets, hauled to Michigan and have been sitting on a shelf waiting for today. 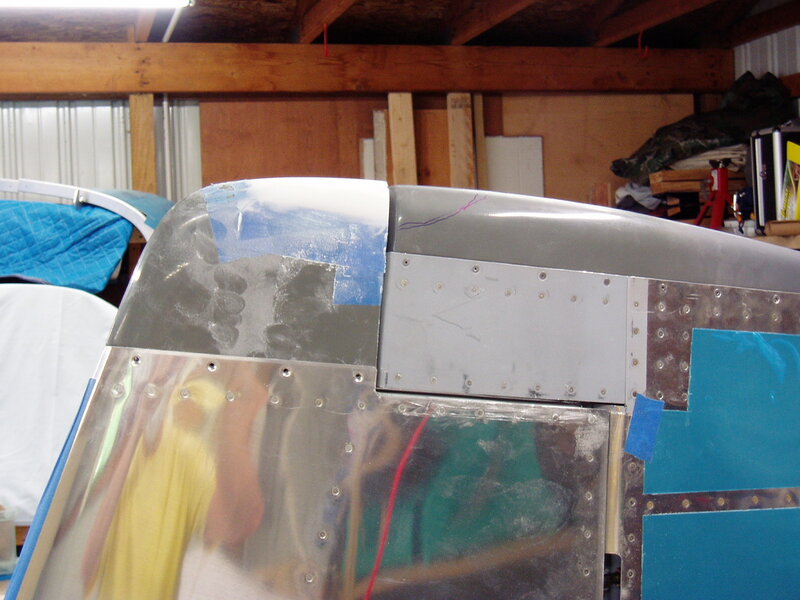 The entire process of mounting the empennage, adjusting balance weights and travel stops, installing and smoothing fiberglass tips and connecting controls lasted until July 1, 2016. 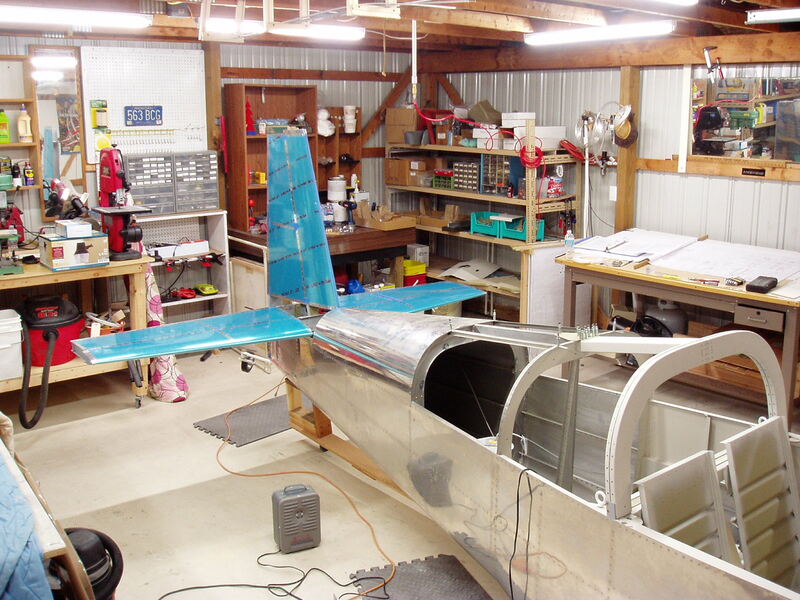 Other non-empennage tasks were also completed during this interval. We were careful to align the HS with the fuselage, measuring from the tips to the same rivet position on each side. Then, drill and bolt. It was necessary to trim the rear outboard skins of the HS to allow clearance for the elevator balance arms. The elevators were temporarily attached. Then the elevator control arms were drilled for a center pivot and the push/pull control rod connections. 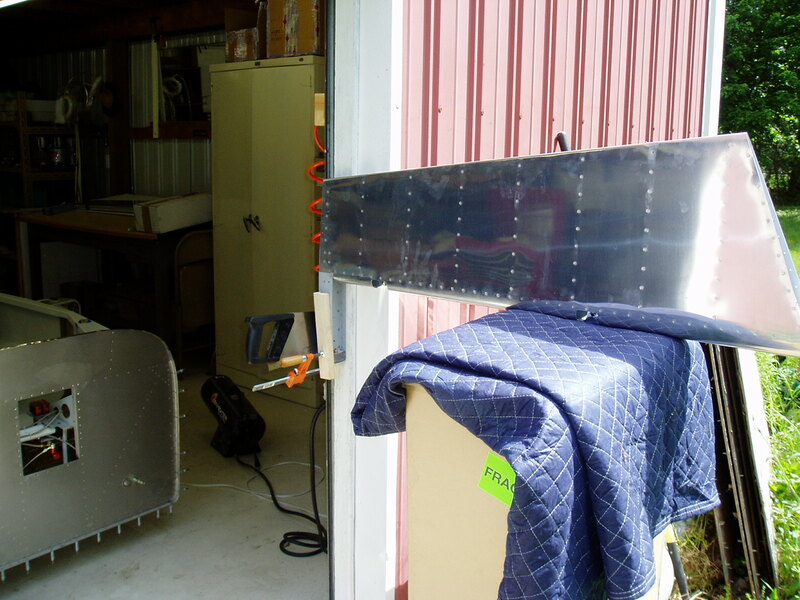 The vertical stabilizer was mounted with it’s tip to elevator tip distance exactly 62 1/4 inches on both sides. Elevator travel was measured as 25 deg. up and 27 deg. down. Later, after adding stops and adjustment the final measurement was 28 deg. up and 21 deg. down. When the rudder was installed with stops, it’s swing was set to exactly 35 deg. right and left. Van’s plans call for trimming of the lead counterbalance weights that are installed in each elevator balance arm. Our band-saw wouldn’t do it so I jury rigged a clamp and hand saw. 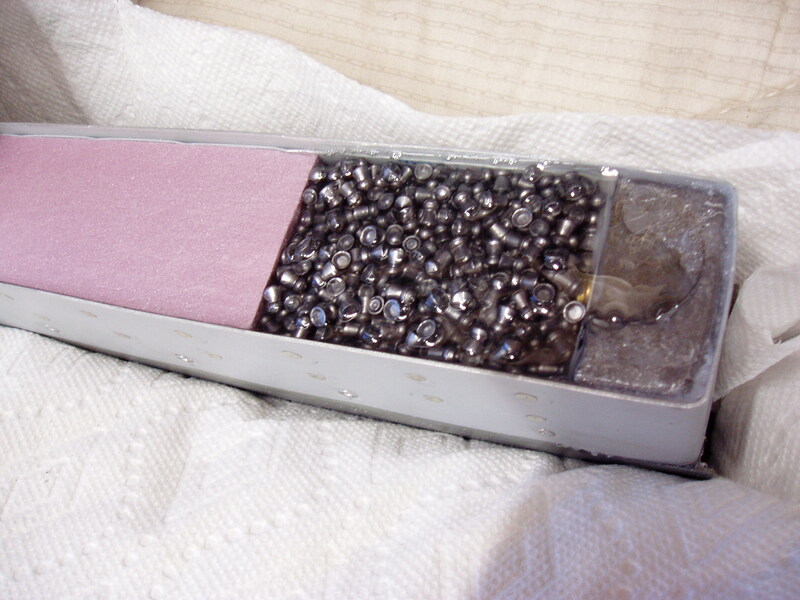 ~10.6 ounces of lead was removed. The Right elevator balanced OK per Vans criteria, slightly elevator nose heavy. Addition of the electric pitch trim servo overbalanced the left elevator tail heavy. More weight ~2 oz. was put back into the left balance arm. 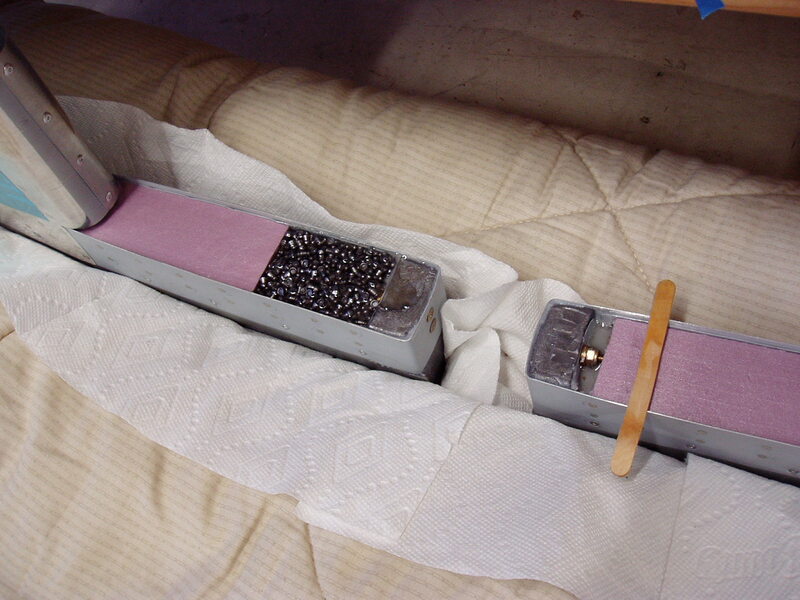 The above photo shows the pink slab foam, 0.17 lead shot pellets and a portion of the large lead weight epoxied into the left elevator balance arm. After an initial layer of epoxy, both arms were leveled to the top of the aluminum with a micro-bead epoxy paste, and then sanded smooth. As received, the Vans fiberglass tips did not align well. These photos show how much epoxy/micro mix was added to the HS tip. 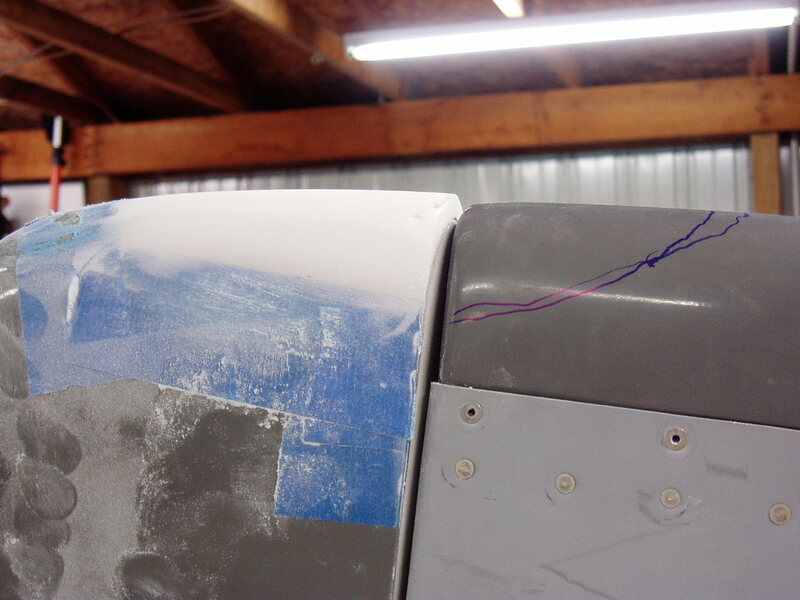 The pen lines outline the rudder area next to receive micro. 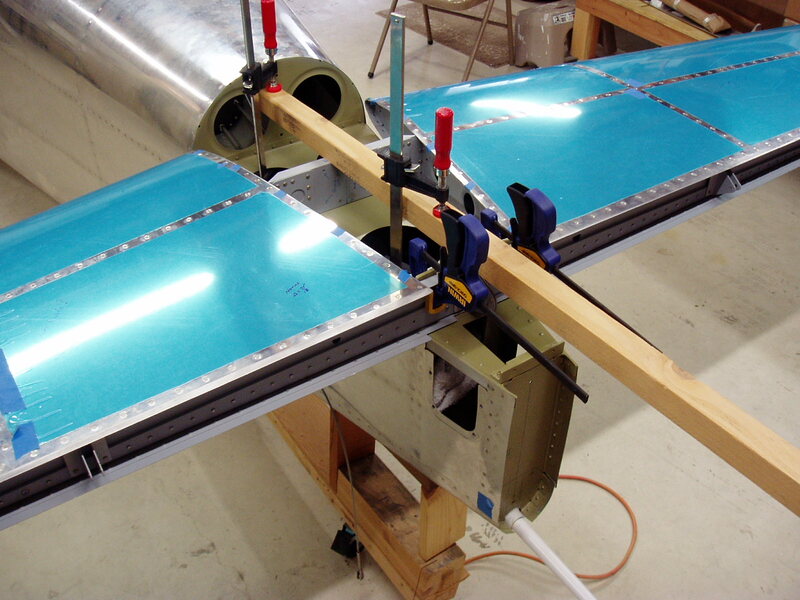 The rudder was held in alignment with the wired wood strips. 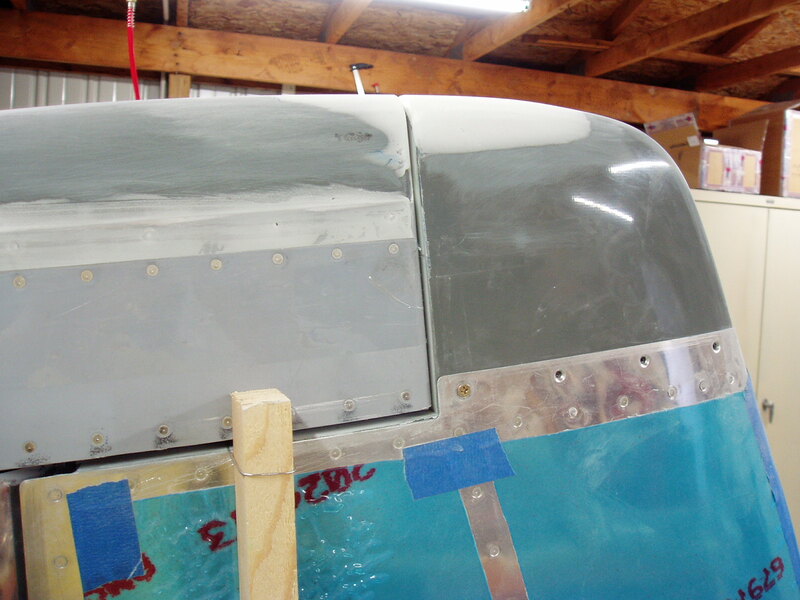 NOTE the VS tip is screwed to nutplates in the fiberglass tip while the rudder tip is pop-riveted. This is to accommodate a vertical stabilizer taxi guidance camera in this conventional gear aircraft at some time in the future. While installing the rudder lower fiberglass tip, I also installed an AeroLEDs strobe tail light. The strobe driver is fully contained in the tail light. It will later be wired to synchronize with the wing strobes.